1939 Austin 8 saloon car. Homepage. This page: A red example of the pre-war Austin Eight saloon, AR series, plus another in The Netherlands. My thanks to Frank for sending his colour photograph from the early 1960s over. It features his six-light, four-door Austin 8 saloon from 1939. This model was produced from 1939 to 1947, with a pause in civilian car production taking place for a few years during the war. This example Frank inherited from his grandfather, and as was common with pre-war cars that had survived into the 1960s, it has been adorned with a selection of "go-faster" improvements, including Moon Eyes stickers, stripes over the roof, racey strips of tape over the headlamp lenses, and even a furry steering wheel cover. At the time, the early 1960s, the Austin 8 was used for trips out to Blackbushe Aerodrome as Frank was a fan of drag racing, a relatively new sport to the UK. Drivers of the day included Tommy Ivo and Don Garlitts, in cars a world away in terms of performance from the diminutive, four-cylinder sidevalve Austin. Frank's car was registered BDP 98, a series introduced in Reading during January 1939. This must make Frank's 8hp Austin one of the very first examples to roll off the line at Longbridge. The model was introduced to the public on February 24th, 1939, at the Berlin Motor Show. 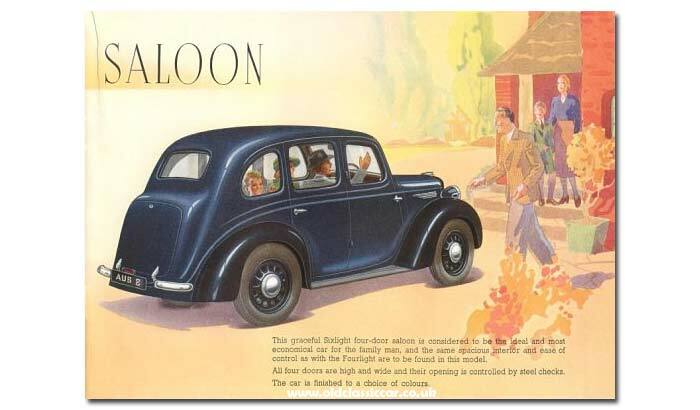 Four- and two-door saloons were offered, as was a tourer and a 6cwt van version. Visually, the 8 looks very similar to the 10, the key difference being that the 8 has a single rear window, while the larger-engined 10 has a split-window arrangement. 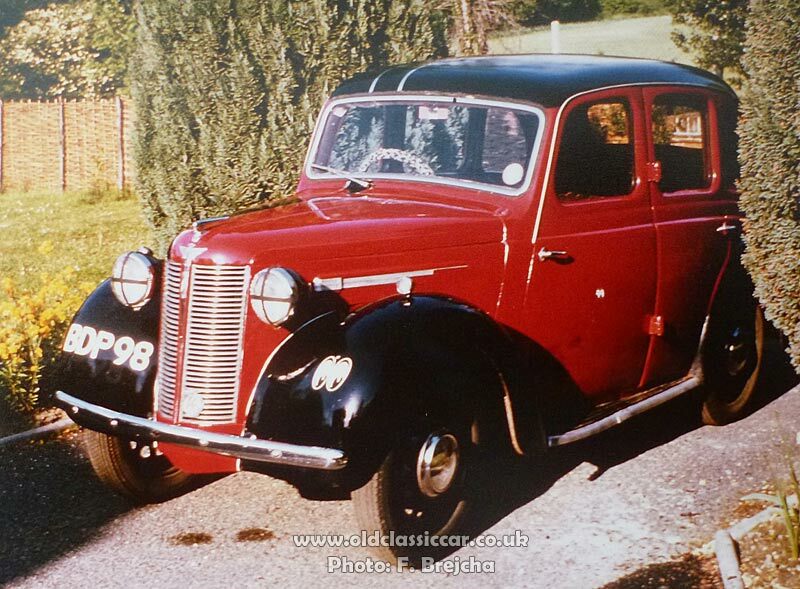 A post-war photo of the sister model may be found on the Austin 10 GS1 page. 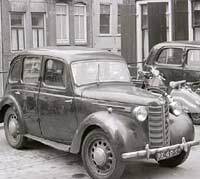 A four-door "Eight" in Utrecht, 1958. Leo regularly drops me a line with a photo or two. 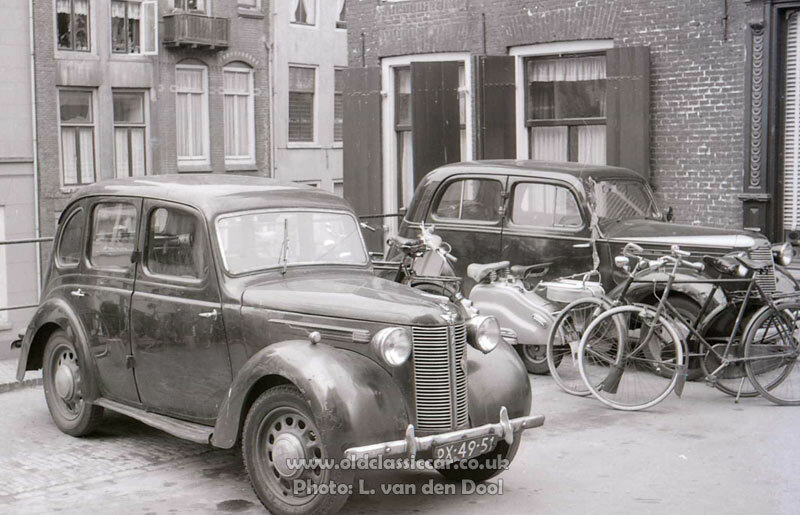 Included in a fascinating set of images he sent is this black & white photo of a four-door Austin Eight saloon, seen in Utrecht. The year was 1958. At the time, Leo and a friend were enjoying a cycling trip, and took a number of motoring-related photographs in the city. The small rear window confirms that this is an Eight rather than a Ten. Years spent driving in a busy city have evidently taken their toll on the Austin's bodywork. The front wings bear many a scar, as does the front bumper and numberplate, while the token running board bears witness to regular traffic. The car is righthand drive. A two-door Austin 8 saloon. 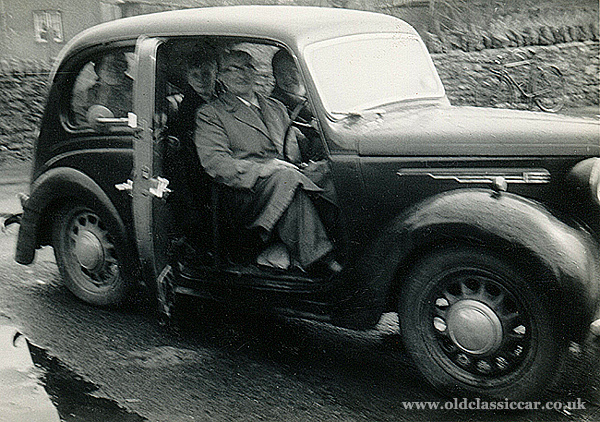 No information accompanies this old photo of a two-door Austin 8, printed on Kodak Velox paper. 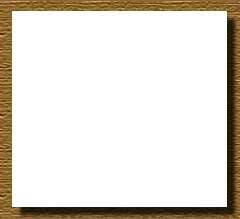 It's a little blurred but still deserves a spot on this page. 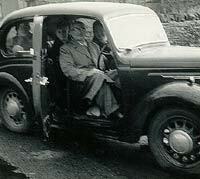 Presumably the family shown were on their way out on, or returning from, a trip out in their compact and well-laden Austin. The car looks to be a standard two-door example, note the extra rear view mirror that has been attached to the forward edge of the (rear-hinged) driver's door. Wing-mounted mirrors were often of limited effectiveness on a car with separate wings, especially if the driver wasn't overly tall, so extra mirrors fitted to door edges and quarterlight window frames were quite popular. Wherever this group of people were off to, or returning home from, they'd picked a rainy day for it. 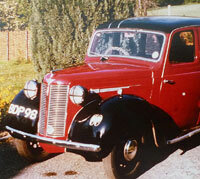 The two-door Austin 8 wasn't sold following WW2, so most likely this is a 1939 example. The introduction of the 8 and 10 was big news for Austin. Previously their small-car offering had been the famous "7" model, which could trace its roots back to 1922. By the late 1930s the 7 had grown in weight and was beginning to look out-dated, especially when compared to rival offerings from the likes of Morris, with its new Series E model. The 8 and 10, with their modern - vaguely transatlantic - styling, were much improved over the stop-gap "Big 7", although the outgoing car's engine was re-used in the new 8 after a few updates. The scans below are taken from an early sales brochure. "The power-in-action lines of this new frontal design typify the superb styling and up-to-the-minute construction of every detail of the new Austin '8'". "It's News! The car of the year is here. The new Austin '8' is creating a sensation. Comfort, looks, performance, room - it has them all. The 900cc engine does over 40 to the gallon and has a high turn of speed with smart acceleration. Good visibility and powerful Girling brakes give safety and ease of control. The spacious interior provides ample room for 4. Make sure your customers see this amazing car without delay." By the time of the 8's introduction, the country was readying itself for conflict, which began officially in September of 1939. 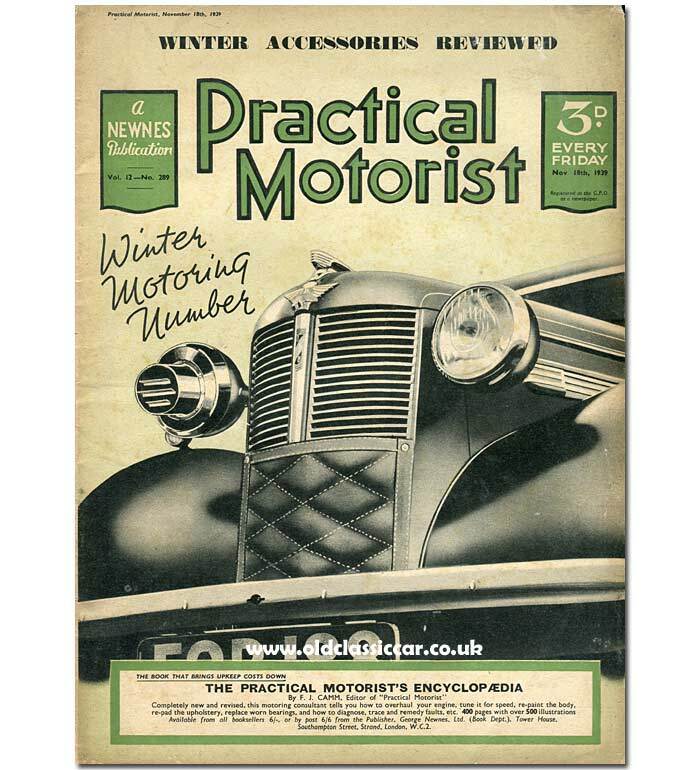 The November 18th 1939 issue of Practical Motorist magazine has a fine illustration of an 8 on its cover, fitted with a black-out mask to its headlamp, and a radiator muff (cover). This looks to me like an airbrushed version of an image that had featured in an official Austin advertisement from a few months earlier. Footage of a surviving 8, described as a 1938 (?) staff car, has been uploaded to Youtube and shows its engine being fired up for the first time in a number of years. Other references to 8s on OCC. 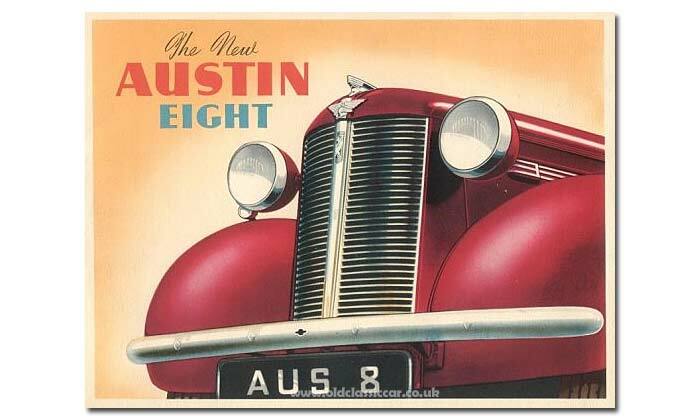 The Austin 8 in its various forms can be found across this site, below are links to some of these items. More old car pictures like this can be seen in the vintage car photograph section.